Modern electronics can trace its roots to the ﬁrst electronic devices called vacuum tubes. Although, today, solid state devices have totally replaced the vacuum tube, the fundamental principle as to its usage remains relatively unchanged. For more than 40 years, until the late 1960s, the most important part in a consumer electronics product was the vacuum tube. It is with this historical perspective in mind that this section is presented so that readers will not lose sight of where it all started. shown in Fig. 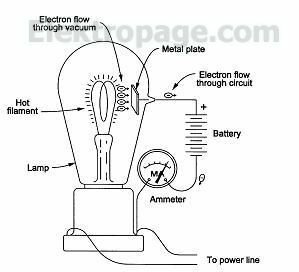 Edison observed that, when the ﬁlament was hot and the plate was positively (+) charged by the battery, the ammeter indicated a current ﬂow through the vacuum, across the gap between the ﬁlament and the plate. When the charge on the plate was reversed to negative (–), the current ﬂow stopped. As interesting as this phenomena was, it did not improve the life of Edison’s lamps and, as a result, he lost interest in this experiment and went on to other bulb modiﬁcations that proved more successful. For about 20 years, Edison’s vacuum tube experiment remained a scientiﬁc curiosity. In 1903, as radios were coming into use, J. A. Fleming, in England, found justwhat he needed to rectify alternating radio signals into DC signals required to operate headphones. By hooking up Edison’s vacuum tube to a receiving antenna, the tube worked like a diode. When the signal voltage increased in one direction, it made the plate positive (+), and the signal got through. When the signal voltage increased in the other direction of the AC cycle, applying a negative (–) charge to the plate, the signal stopped. The vacuum tube, also called the electron tube, required a source of electrons to function. In Edison’s original electron tube, the electron source, called the cathode, was the ﬁlament that, when heated red-hot, emitted electrons that ﬂew off into the vacuum toward the positively charged plate, called the anode. The effect of heating the cathode to activate the electrons was called thermionic. Other electron tubes used high voltage to pull the electrons out of a cold cathode. Electronic emission also occurred by applying light energy to a photosensitive cathode. Tubes using this effect were called photoelectronic vacuum tubes. Although a variety of methods existed to remove electrons from the cathode, the thermionic vacuum tubes were the most widely used. The cathode was either heated by resistors within or used a separate source of power for heating. 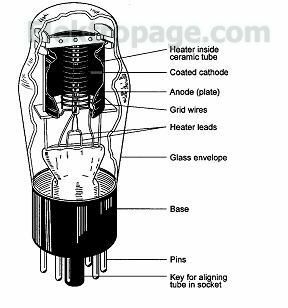 The vacuum tube consisted of a glass or metal enclosure with electrode leads brought out through the glass to metal pins molded into a plastic base.